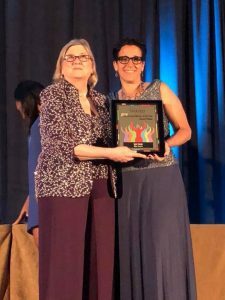 Kyber CEO Lynn Souza wins Enterprising Woman of 2018 Award! Kyber Security CEO Lynn Souza was honored at an awards ceremony in Miami Florida this week as one of 2018’s Enterprising Women of the Year. The Enterprising Women of the Year Awards is widely considered one of the most prestigious recognition programs for women business owners. To win, nominees must demonstrate that they have fast-growth businesses, mentor or actively support other women and girls involved in entrepreneurship, and stand out as leaders in their communities. Many of the honorees also serve as leaders of the key organizations that support the growth of women’s entrepreneurship. Lynn has been recognized for many honors over the years as a successful woman business owner. “Of all of the awards we have received, I am particularly proud of this one.” Says Souza. “In an industry dominated by male CEOs we have shown that anyone with the determination to succeed in IT Security can do it with the right team”. “We are all very proud to work with such a dynamic leader as Lynn. She really is an inspiration to us all,” remarked Kyber President Michael Giuffrida. Kyber Security has been providing quality IT security services to small and medium sized businesses in Connecticut, New York, and Massachusetts since 1985. Dedicated to delivering enterprise grade security to the SMB market, Kyber Security is laser focused on protecting organizations and their valuable data from cyber criminals.